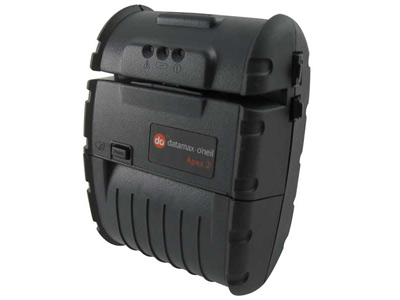 The Datamax-O'Neil Apex 2 mobile printer is a lightweight and economical tool for any mobile retail or line busting operations. All models come with RS-232 serial interface and your choice of Bluetooth or 802.11b/g wireless radios, giving you both corded and cordless printing options. A 2" print width keeps the Apex 2 slim, fitting easily on a belt. The overmold design of the Apex 2 protetcts it from drops and allows it to operate in temperatures as low as 14° F. For added protection, an optional environment case offers an IP54 seal, keeping out dust & water. With a battery that lasts over a full shift and a build quality to hold up to harsh, abusive environments, the Datamax-O'Neil Apex 2 is the smart choice for any mobile priting operation. Find it faster! Click here to compare Apex 2 models by feature. Browse all Apex 2 models now or call 800.903.6571 for assistance.